It has gotten cold outside, and what with the large hole into the attic, it was pretty cold in the house, too. That keeps the majority of the air in well enough that we could turn the heat back on. It's still not as good as when everything is closed up, but it's bearable in the house now. We have houseguests coming this week, which is always exciting, but especially so when you have great big holes in your house. 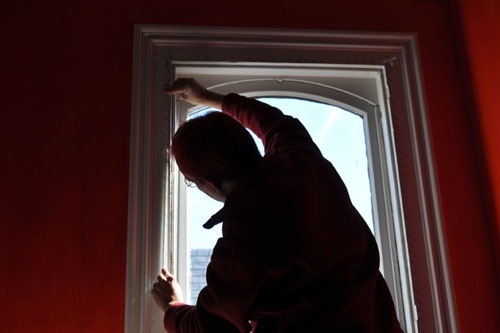 So Noel spent some time winterizing one of the windows in the front bedroom, as well. This window is one of the reasons I just laugh when people tell me our old windows can be restored. While I appreciate the sentiment, many of our windows are this bad, and are not restorable. This one is barely holding in there, and if our two attempts with window companies hadn't turned out to be so unpleasant, we'd have replaced it years ago. The frame is so badly damaged with some kind of wood rot that the glass tends to slide out, and the whole thing was sagging down, leaving gaps at the top of the window. So Noel screwed in a couple brackets to hold the upper sash in place. 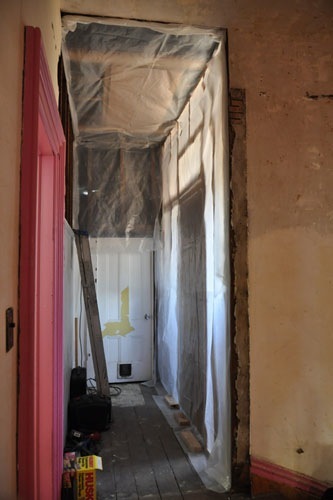 Then he installed a window insulation kit over the whole thing to keep drafts out, so the front room is snug and warm now. Are you going to replicate the window, eventually? I had a wide but fairly short 1920s picture window in my craftsman house that had a rotted frame. I tried opening it once after I first moved in, and the wood started to bend. Ulp. So I just left it shut. I am not big on the kind of courageous ripping big stuff up you folks do. It would have been amazing to have that window open in the summer though. Our big plan is to replace all the windows with double-pane insulated glass. Entire windows where necessary, just the sashes if that works anywhere (I doubt it will, given the condition of our wood). But each window is at least $2000 because of the height, so money is a limiting factor. Ouch! At $2000 a pop for replacements, it might be worth it to bring in a pro to restore one or more of the really bad ones, watch how he/she does it, and then do the rest yourself. I restored some windows in our house that were at least as bad as the one you show here. Something to consider. 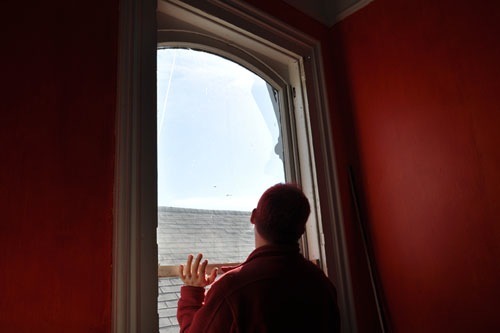 I remember when I moved into my place on Fell street (the oldest building on the panhandle), tried to open my window, and wound up with an entire sheet of glass resting on my wrist. Those old windows have awful failure modes. Whatever happened to the front door transom window? Dave, there's nothing to restore. 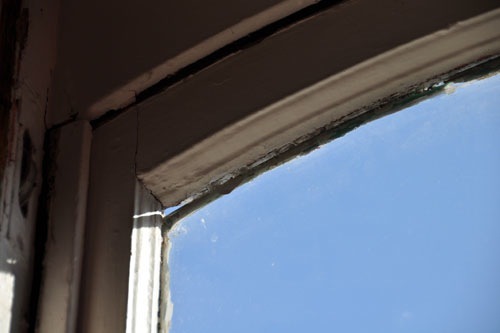 The window frame is entirely held together with epoxy wood filler. I'll have to write about the resolution of the transom window at some point, but the end result is we keep the window as-is for now for a discount. But now I need to replace that window, too, even though we've already paid to replace it. We have a mix of old, single pane windows (not that old, actually, compared to yours) and new Marvin windows and OMG I love the new ones. Especially since they look just like the old ones, but open and close and aren't rattley. Cheers to new windows as the budget allows for it :). Sometimes restoration isn't the best path. That's exactly it. We specifically chose a house of little interest to local history so we'd be able to put in things like new windows if we wanted to.